So you decided that you would like to explore the plunders outside of the Chamonix Valley for a day. Whether it’s a special occasion or a just for a change of scenery there is plenty on offer and for those with the Mont Blanc Unlimited Pass with no need to buy an additional lift pass. We at Peak Transfer talk about our Top 3 Skiing Day trips from the Chamonix Valley and why we love them so much. The Italian border is only 17km from Chamonix through the Mont Blanc Tunnel and the ski resort of Courmayeur just 5km further. This short transfer makes Courmayeur a great and indeed popular day trip for those in the Chamonix Valley wanting a change of scenery. Courmayeur as you would expect of any Italian resort has a magnitude of character, spectacular scenery and takes its cuisine, coffee and style very seriously. With probably the best mountain food available locally Courmayeur is a definite must for the foodies amongst you. Courmayeur is a splendid Alpine village with lots of charm witnessed first hand from the pedestrianised cobbled high street brimmed with restaurants, shops, bars and cafes. Apres is not your ‘dancing on every available flat (ish) surface like that found in the lively bars in Chamonix but a more typical bustling bar scene, Courmayeur is all about the Eat, Drink, Ski, Repeat. Courmayeur as a ski resort in terms of marked pisted runs is pretty limited totally just over 36km. Best for intermediate level skiers or those wanting a more relaxed day out on the slopes basking in glorious Italian sunshine. That being said although the Italians may like to stick to the marked pisted runs whilst skiing, Courmayeur can offer so much more off the pistes. Presenting the most versatile and arguably the most fun off-piste lines around fantastic for the new off-piste adventurer. The experienced freeriding adrenaline junkies will love the plentiful and steep couloirs and heli skiing available. Courmayeur is the perfect day trip providing something to suit everyone’s snow-related desires. 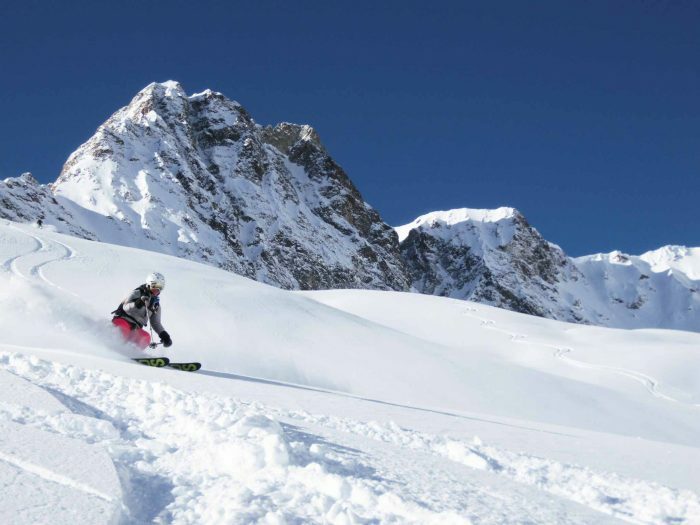 For more information of Courmayeur on the best freeride and off piste itineraries in Courmayeur check out our recent Courmayeur – Best Ski Resort for Off-piste Skiing article. Or for more information about the resort itself visit the Courmayeur Mont Blanc website. Peak Transfer provide private resort Transfers to Courmayeur from both the Chamonix Valley and Evasion Mont Blanc Ski areas (Megeve, Les Contamines & Saint-Gervais). Arrive on the slopes in style, stress free at a time that suits you. We can pick you up directly from your accommodation and drop you right at the lift entrance, and vice-versa on the return leg. For more information or to get a quote send us an email or give us a call and we would be happy to advise you. Just over an hours drive from Chamonix over the Col des Montets into Switzerland and approximately 90 minutes from the Evasion Mont Blanc Ski areas you will find the renowned ski destination of Verbier. Verbier is part of Switzerland’s largest ski area the 4 Vallées attracting the young adventurous and the big money makers across the world. Verbier is practically Chamonix’s Swiss twin in terms of ski terrain, scenery and apres mindset, just a bit more sunnier and perhaps better connected! This would explain why it is such a popular extension of the Mont Blanc Unlimited Pass and features regularly on a Chamonix holiday itinerary. The relatively open ski area is predominantly south facing making it an all day sun-trap with a view! On a clear day it is quite possible to admire the view of both French and Italian Alps in addition to the immediate Swiss laid peaks. The marked ski area features just under 100 lifts and over 400km of pisted slopes. Being a reasonably high altitude resort in the Alps snow cover is usually good, supplemented by quality snow making facilities throughout the resort makes Verbier a safe choice even in early / late season. The Médran gondola is like the main supply chain to the resort where the majority take on the intermediate skiers and snowboarders dream of plentiful interwinding blues and reds. For families the terrain park and thrilling ski / border-cross is always a hit. Not the best for mixed ability groups that have beginners due to the disjoint between the nursery slopes and the rest of the ski area but Verbier’s true calling is its claim to probably the most accessible extensive off-piste terrain in the Alps. Like Chamonix, Verbier is a key feature of the Swatch Freeride World Tour, the finals of it in fact (Xtreme Verbier). Verbier High Five a competition allowing amateur skiers to throw down the gauntlet to the top professionals to showcase their off-piste talents that’s just as exciting to spectate as it is to compete. It is a freeriding paradise with everything from marked but ungroomed pistes for the less experienced to 30-40 degree slopes and couloirs for the adventurous riders with the appropriate gear and experience. To make the most out of an off-pisting day trip be sure to book a local guide who knows exactly where to go for the best snow and lines in the 4 Vallées, plus you get to jump all the lift queues while you’re at it! Compared to Chamonix things are a generally a little bit more expensive in Verbier, as to be expected in Switzerland! But the view is free (forgetting the Mont Blanc Unlimited Pass you purchased!) and the one from Mont Fort (3,330m) is a truly splendid one, taking in two of the most history rich peaks around Mont Blanc and the Matterhorn. At the end of the day you generally find yourself at the foot of the Médran gondola where you will encounter floods of restaurants, bars and shops. It’s well worth sticking around well after the slopes close here if you can. Despite the town itself not having much character, this is more than made up for come Apres, by the cosmopolitan yet wild clientele who frequent there. Verbier really knows how to have a good time and do Apres in style! If you book a private transfer with us we can provide a door to slope service, there and back, at times to suit you! No having to cuddle your skis or snowboard whilst squashed like a tinned sardine on a public bus when you could let your personal driver do all the hard work for you in the comfort of your own private vehicle. Especially when you get to stay and appreciate the Apres scene when others have to catch their bus back to Chamonix or beyond! We recommend getting to Verbier early so that you can discover as many of the delights the 4 Vallées has to offer including the cultured Apres! For more information or to get a quote send us an email or give us a call and we would be happy to advise you. New to the Mont Blanc Unlimited Pass this season is access to the Domaine Evasion Mont Blanc. This is a neighboring ski resort to the Chamonix Valley and transfers take just 30 minutes to the Saint Gervais Telecabin and approximately 45 minutes to Megève. Unlike Verbier this ski area is almost at complete contrast to that of Chamonix being a low altitude tree lined paradise. Authentic savoyard farming village charm can be found all over the mountain with traditional alpine chalets and perfectly located snow draped outhouses just begging to be jumped off. The biggest appeal to this area is how well connected it is with the main areas of Saint-Gervais, Megève, St Nicolas de Véroce and Côte 2000 all being interlinked with lifts and no need to catch a bus or train. 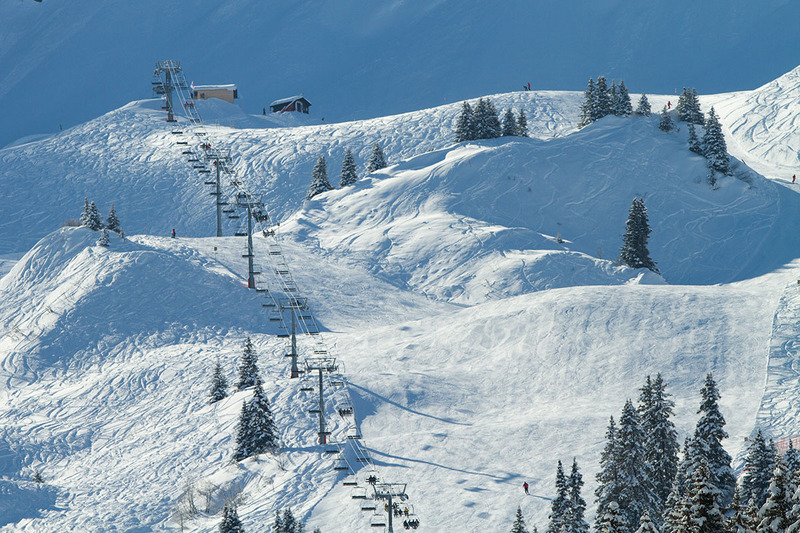 Additional ski areas of Les Contamines and Combloux are a 20-minute and 10 minute bus ride respectively. 217 marked slopes stretching 450km (33 black, 84 red, 63 blue, 37 green) across the entire ski area provides a nice change of scenery. Definitely a more gentle day out on the mountain can be had here or more in terms of freestyle skiers and snowboarders at the snow park and ski cross course. Arguably the best tree lined pistes/off-piste locally this ski area is great to ski even on the moodiest of days with protection offered both by the trees and the sheltering Mont Blanc Massif itself. Although the love of all things snow encompassing runs deep here, skiing and snowboarding is not the be-all and end-all in the likes of Megève, Saint Gervais & Les Contamines. It’s more about enjoying oneself and the experience along the way. Each area with its different flavour: Megève being all about the exclusive papering of its Michelin dining and 5-star spa hotels, Saint Gervais about its family friendly fun and thermal baths, or Les contamines with its much more gentler and quieter pace of life close to nature. Apres is generally a more sophisticated or family affair this side of Mont Blanc so although you are less likely to find rowdy crowds dancing on every given available surface you will find plenty of content holidaymakers enjoying a drink or two leisurely on the mountain throughout the day. This past season however, Saint Gervais has recently thrown in a curve ball in the form of the newest host of the Folie Douce Chain, which has been embraced with open arms. At the end of a day on the mountain you can choose to sample the exorbitance of the Megeve wine bars frequented by the rich and famous. Or grab a well earned hearty Savoyard meal in the villages of Saint Gervais or Les Contamines. Due to being a rather low altitude ski area the top lift just shy of 2,500m it is susceptible to recent snow conditions and can easily struggle with snow cover at the extremities of the season (particularly early season). Why not make the most of your Mont Blanc Unlimited Ski pass and take a short trip across the valley to experience something a little different. Peak Transfer provide private inter-resort Transfers between the Chamonix Valley and Megeve, Les Contamines & Saint-Gervais. Save the hassle of catching trains, buses and trams when you can have a personal driver pick up you and your equipment from your accommodation door, straight to the ski lifts. For more information or to get a quote send us an email or give us a call and we would be happy to advise you. Peak Transfer hope to see you at the Airport, in resort and on the slopes this winter. Book your airport and inter-resort transfers now at www.peaktransfer.com.